This past week the students of Greenhalge Elementary School explored what humans to need in order to live on another planet. Students started out by thinking about what humans need here on Earth and brainstorming different ideas of how that would apply on another planet. After students thought of everything they could, we came together as a group to make a master list and talk about how those could be replicated somewhere else in Space. From there, we examined the temperatures of the different planets to see which planet might be the best to live on besides Earth. Students saw just how cold most of the planets are and were shocked to see those temperatures in comparison to the temperatures of ice cubes, hot soup, and candle flames. 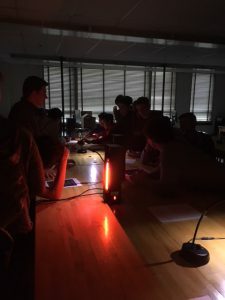 After seeing how a runaway greenhouse effect on Venus made it so hot (demonstrated with a bottle of water and baking soda), students agreed that the most viable planet to live on in the Solar System beyond Earth would probably be Mars. Next time we will explore gravity! Today was the start of the Active Astronomy Roadshow’s after school series with the Greenhalge Elementary school in Lowell. Throughout the course of the semester, we will be working with the students on learning about the attributes of the planets, making telescopes, spectroscopes, landers, and rockets, and reading about famous scientists and important technology needed for Space exploration. The students know a lot about astronomy already and were excited to learn about the planets this afternoon! Students got the opportunity to hear a little about some of the different things that we will be covering over the course of the program and were free to ask any questions. They asked about black holes, the formation of the Moon, astronauts, and all about different planets. After a question session, students made a live model of the Solar System and had the opportunity to see why a model is needed in Astronomy. Finally, students got the opportunity to rank planets, stars, and every day objects based on speed and size. Next week we will be talking about conditions on other planets and what it would take to survive on them! On Dec. 8, the 9th grade class of Weston High School came to the Kennedy College of Science at UML to learn about the college and get the opportunity to experience some of the different areas of study that professors research. 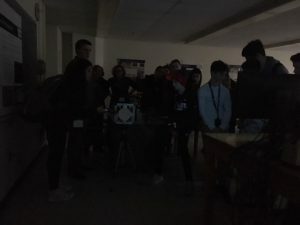 The Active Astronomy Roadshow, led by Dr. Silas Laycock, and supported by Dr. Chandrika Narayan,Tom Heywosz, and Nate Woodward, with technical help from David Riccio, explored light and what it could tell astronomers. 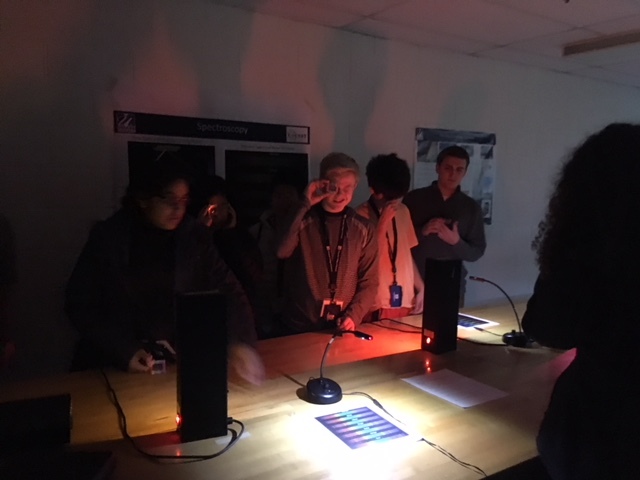 Students started off looking through diffraction gratings at heated tubes of glowing gas to try and distinguish what was in the tube using the emission spectra of the gas. Students looked at Neon (a crowd favorite due to the bright red color), Helium, Hydrogen, and the most difficult gas, Air. After looking at the different gases, we talked with students about how this technology was used in Astronomy, on a much greater scale, to determine the composition of Celestial Objects. After talking about emission spectra, we looked at Schlieren Imaging, which is the process of showing the flow of gases of varying densities. 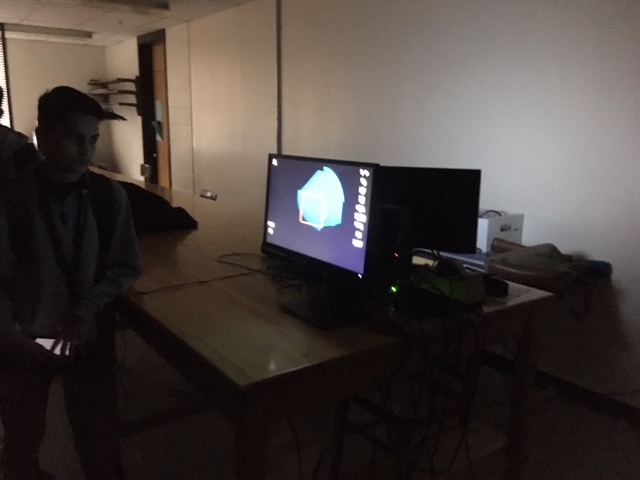 Students got the chance to see gas flowing on a screen connected to a camera and mirror set up. 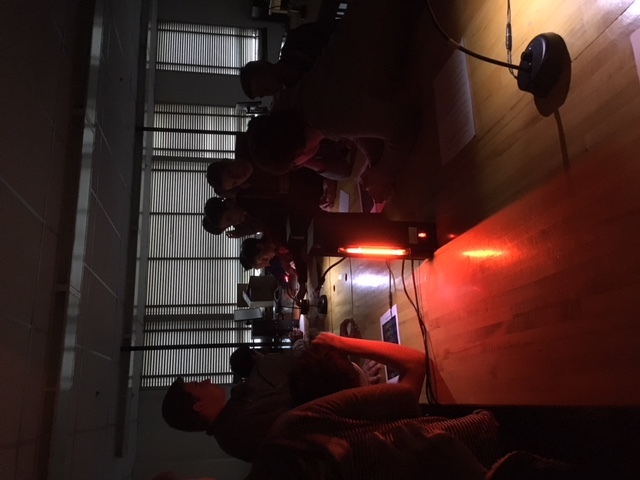 While students had fun playing with a heat gun and compressed air, and Dr. Laycock had fun using the blow torch, the point was to illustrate how much our eyes miss. We need to use all kinds of wavelengths and techniques to see the world in its entirety.